In late January 2018 I returned to Japan for a couple of weeks for a mix of work and holidays. I arrived from Sydney on an early morning flight arrival into Haneda Airport just outside of Tokyo. If you are ever flying into Japan and have an option between the Narita or Haneda airports I would strongly recommend the latter as it is much more convenient and fastest to travel into the city centre. When I arrived at the airport I was greeted by a couple of large Grand Seiko advertising displays. After clearing customs I caught the train into the city and dropped off my suitcase at my hotel. I then headed to the Tokyo Flea market at Ohi Racecourse. It was quite cold and the turnout was relatively small so I did not manage to find anything this time. After leaving the flea market I headed across to Ginza and the Matsuya department store. In this store I proceeded to the top floor where a watch fair was being held. This was a group of vintage watch sellers from around Japan who were offering a wide range of items. 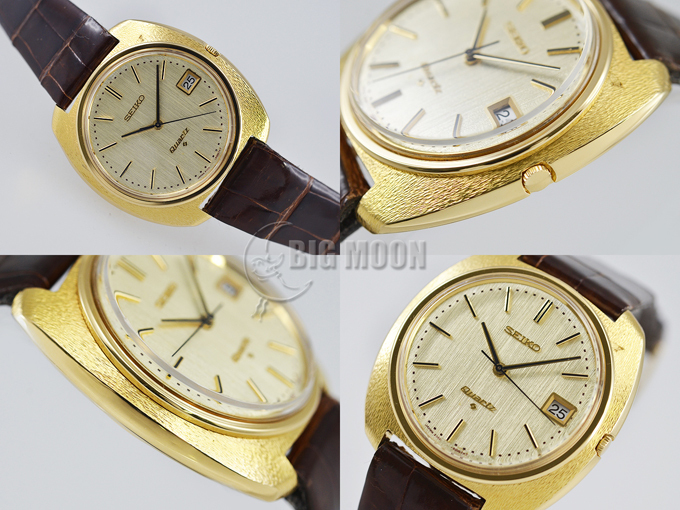 There was a good selection of both Japanese domestic watches as well as European models. One of the models that caught my eye was a 35SQ stainless steel model. This was being offered by BQ Watch and came with the original bracelet. I decided to think the purchase over and was considering picking it up the next day but later that afternoon I noticed that the watch was flagged as sold on the BQ Watch site. After leaving the Matsuya watch fair I crossed the road and visited the Wako store. 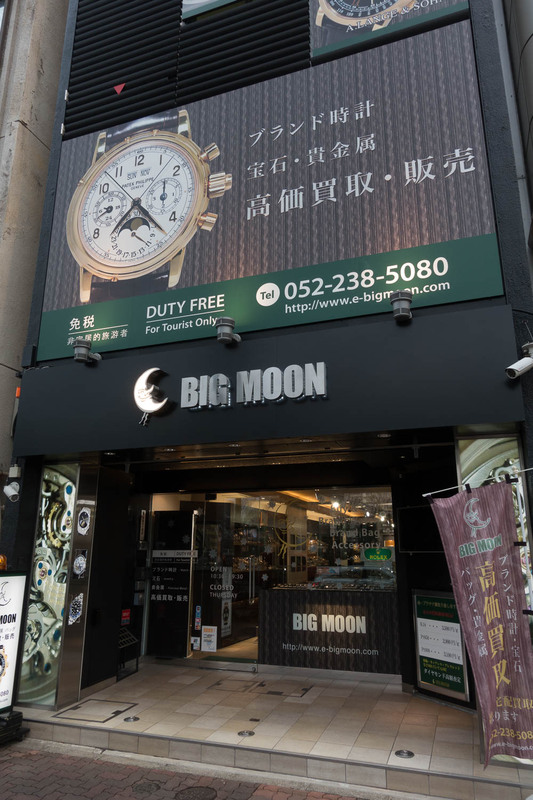 This store is owned by the Seiko Group and is one of their premium boutiques. 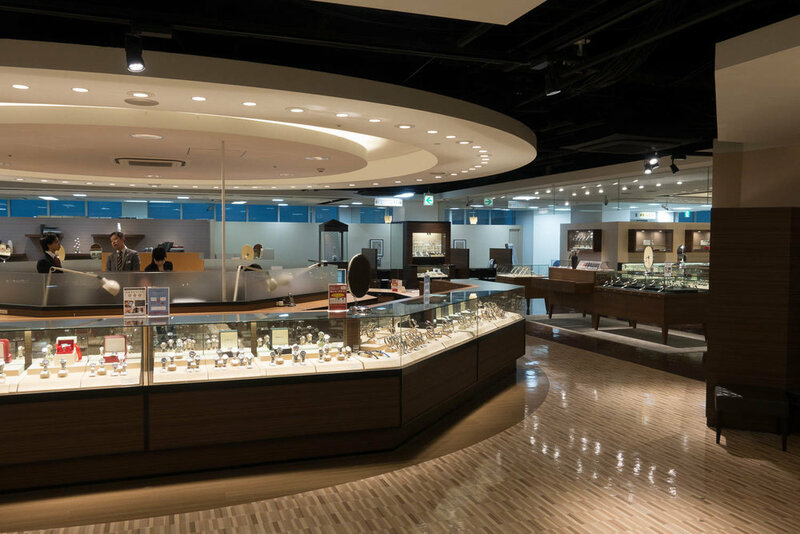 This is a beautifully designed retail space and they have a fantastic range of Grand Seiko, Credor and Seiko models on display in addition to various European brands. The outside of the Wako building has a couple of watch themed markings that can be seen on the external walls. 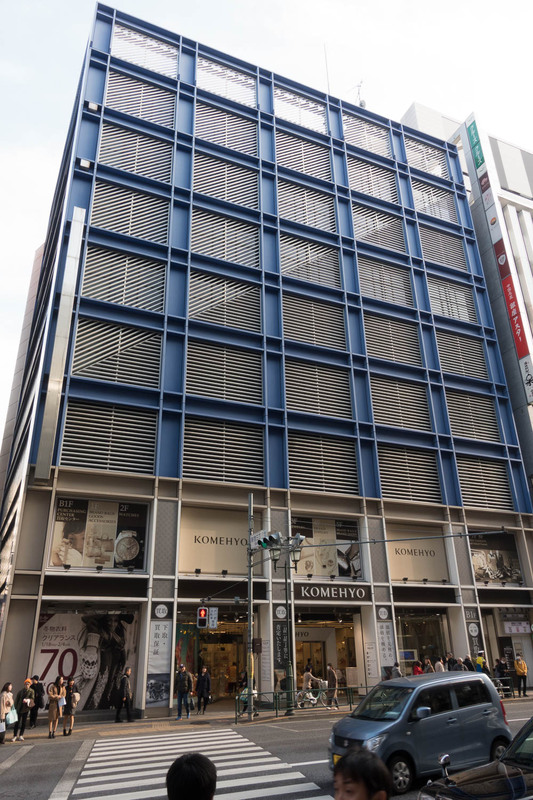 The building is topped by the Wako clock tower that has become one of the distinctive features of the Ginza area. After leaving Wako I headed a couple of blocks away and visited a small vintage watch reseller. 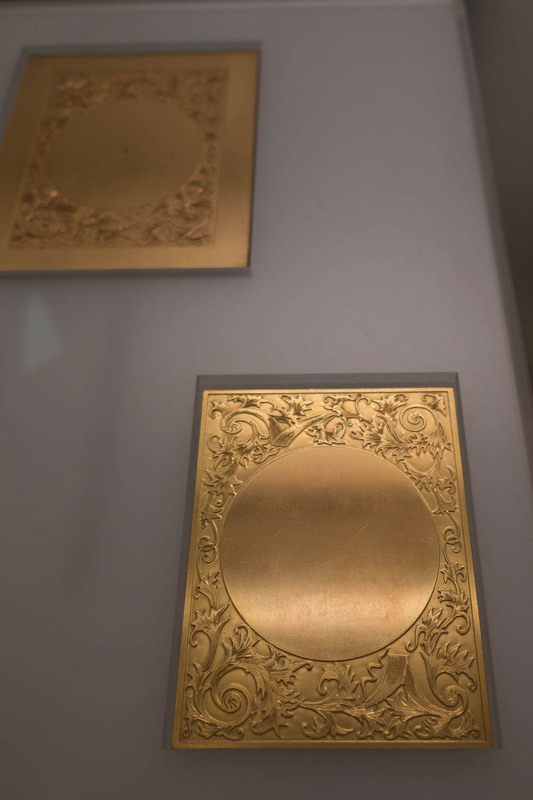 There were a number of interesting golden models and a number of Grand Seikos but nothing that I had to add to my collection. Next stop was CTI Watch also in Ginza. There were a few nice pieces there as usual but nothing that really caught my eye. I then visited Lemon that is located very close to the Yūrakuchō Station and is only a few minutes walk from CTI Watch. There was not any special pieces on sale at this time but I have found that you can never be sure what will turn up so it is worth spending a minute to check out their current items. I then left the Ginza area from Yūrakuchō Station and caught the Yamanote line to Shinjuku where I was able to check into my hotel. Just near the hotel was a brand store Shellbird. 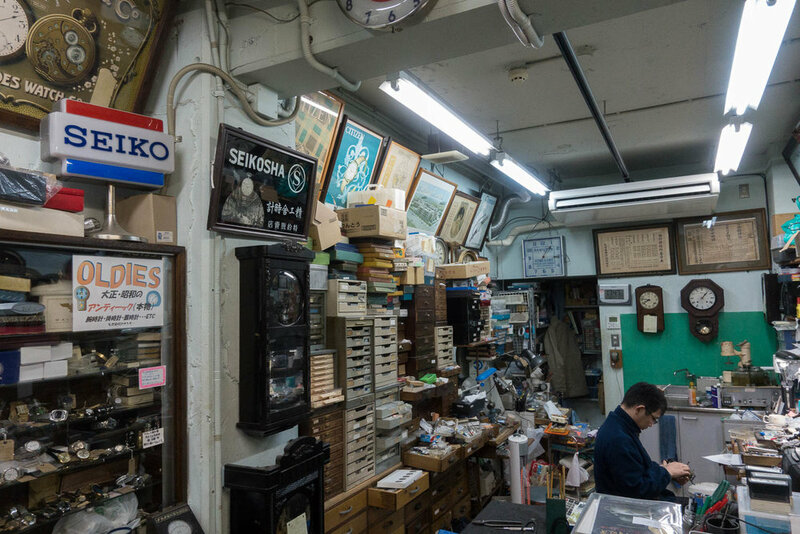 This is a small store selling second hand luxury goods and is one of dozens around the Shinjuku area. 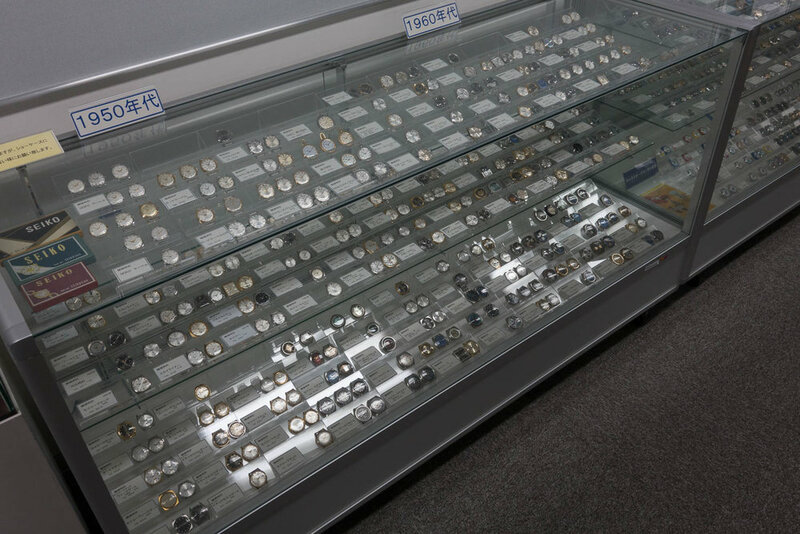 This store had a Seiko 18k VFA quartz (3823-5005) model with box and papers for sale. 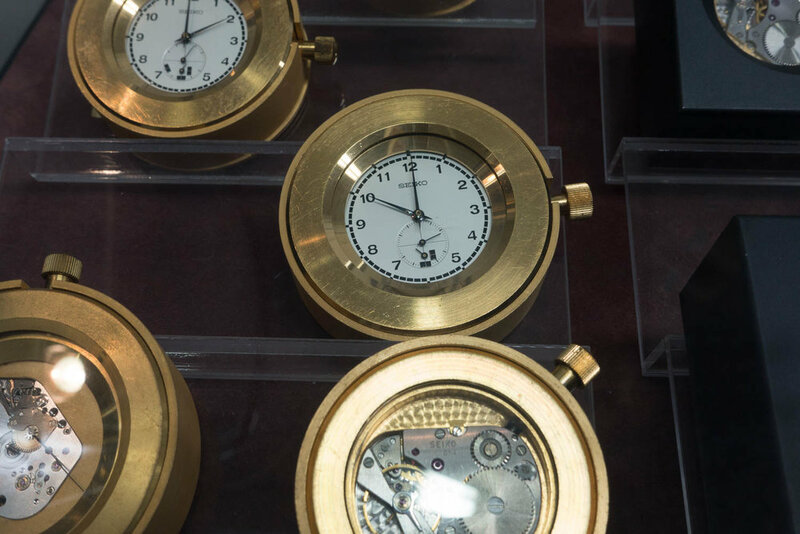 While not a design that appeals to many customers today it does give some insight into the relatively rare watches that will appear in small stores. While in the Shinjuku area I also dropped by the main Komehyo store. 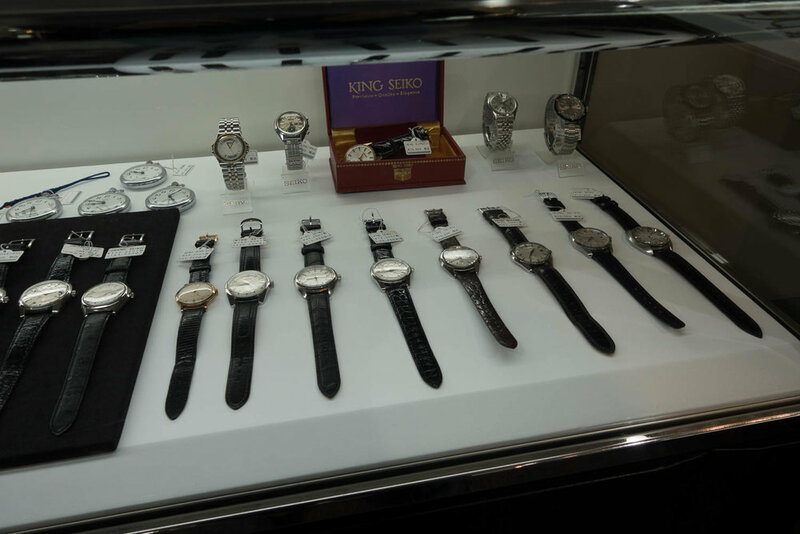 The second floor of the store is dedicated to watches and they always have a large selection of interesting pieces. There were a couple of nice Credor models as well as numerous Grand Seikos. I left the Shinjuku area and went to Shibuya. Here I visited the Bookoff store and picked up a Seiko SBM023 (8F35-00A0) perpetual calendar diver. This was extremely good value and is a nice match to the orange dialled version I picked up on a previous trip. After leaving the Bookoff I visited Housekihiroba in Shibuya who had an excellent range of watches available but nothing that I decided to add to my collection. On Sunday morning I headed to the FMWV (Free Market Watch Vintage) meeting in Ikebukuro. 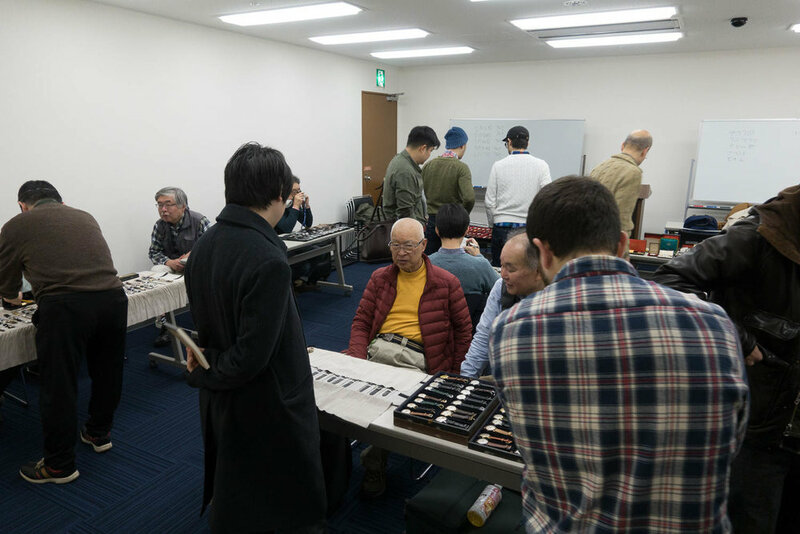 This is a regularly held event with a mix of private and commercial watch sellers in a very informal setting. 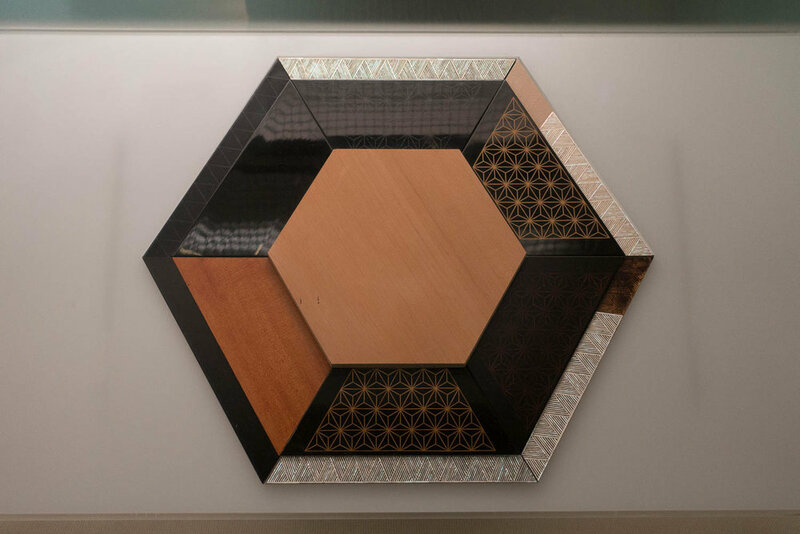 There are usually a mix of very interesting pieces with both domestic and international models for sale. During the event I met up with a fellow watch enthusiast Arnaud from Europe who I had previously communicated with online. He was traveling in Japan at the same time so we arranged to meet up at the market. At this market there were a number of very unusual pieces that some of the vendors were showing. 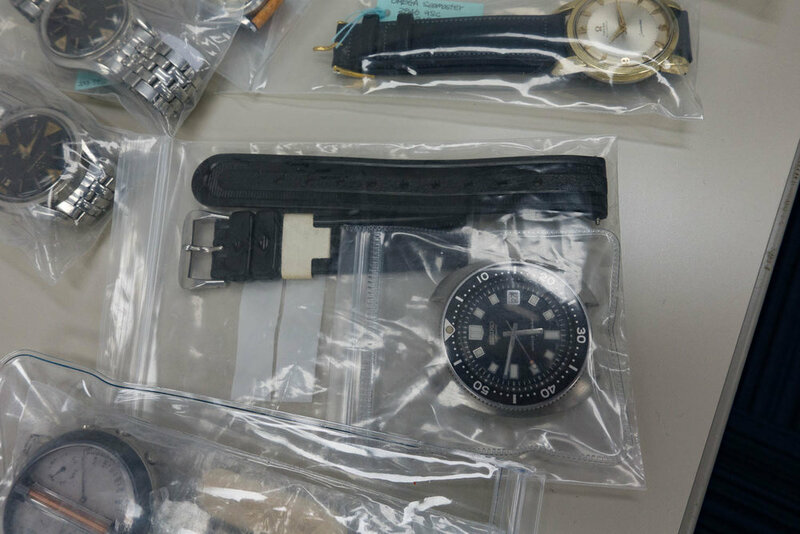 The first that caught my eye was a prototype King Seiko with a modified 4420 movement. This watch beat at 16bps and as you would expect the second had movement was incredibly smooth. This moved like the new Bulova Precisionist with only a tiny amount of stepping visible. It was not as smooth as a Spring Drive but as close as a traditional mechanical movement is going to get. 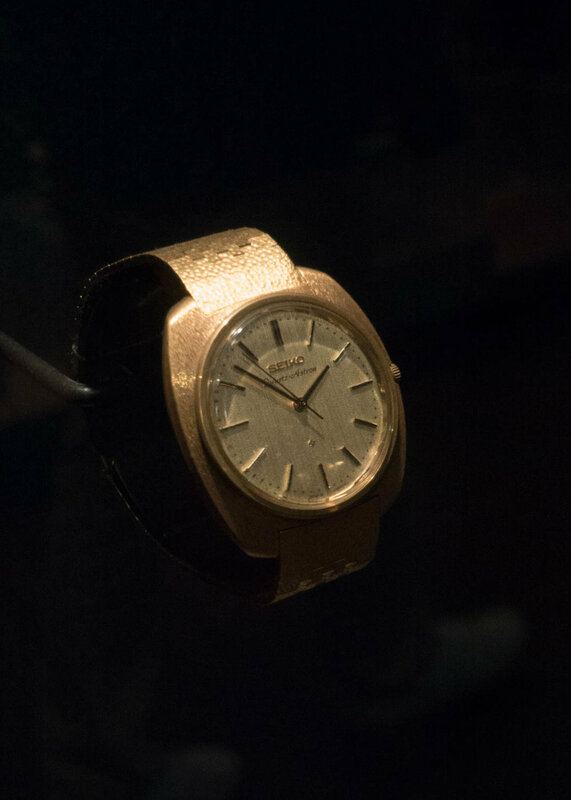 Another interesting model was a prototype movement with an instant date change mechanism. This was housed in a 4402-8000 case but the movement was marked as a 4419. 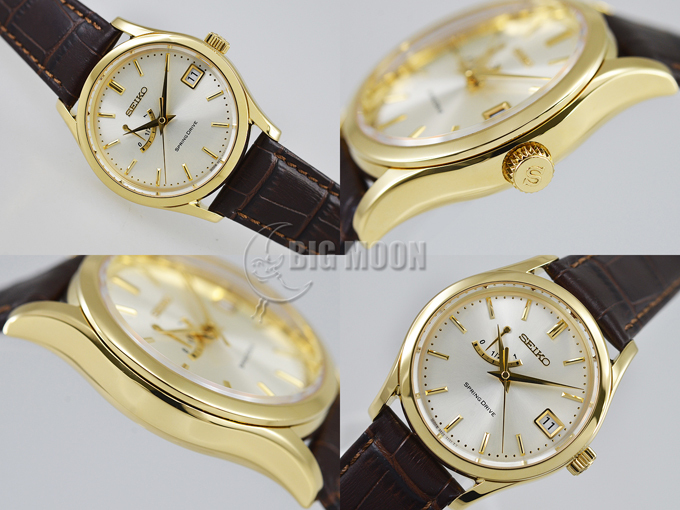 The instant date change operation looked like the instantaneous change seen on some modern Grand Seiko’s. 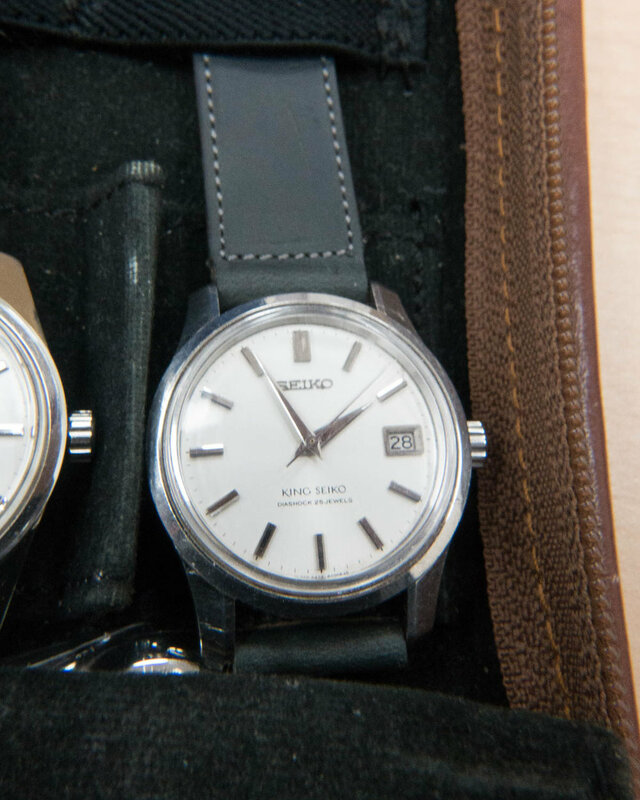 The last of the prototype models were a couple of examples of Seiko’s first electronic movement. These were the EL-300 (30-8000). To my knowledge these were not ever publicly released and that is why you only see the EL-330 and EL-370 models. Another interesting model was a Blue Yacht with a sunburst AD (Applique Dial). Traditionally the Blue Yacht model is seen with the distinctive swirl SD (Special Dial) and I was not aware that an AD version of the watch existed. 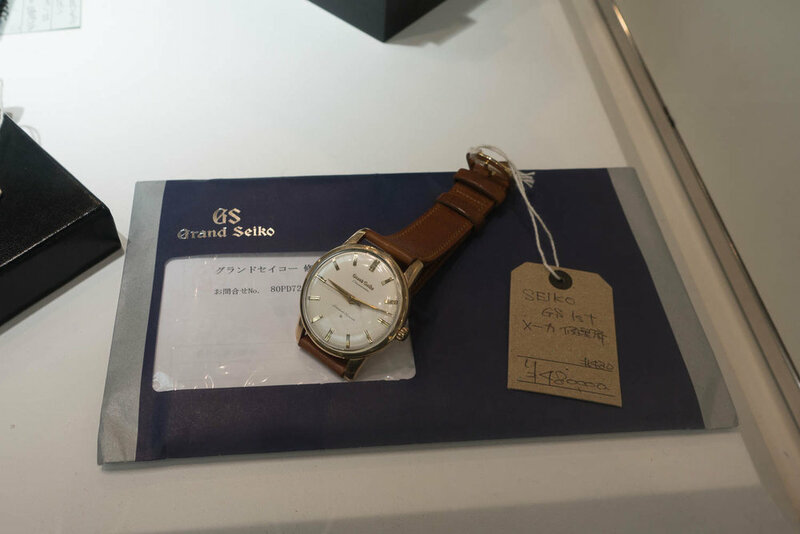 In addition to these interesting watches there was one of the vendors selling a Grand Seiko 61GAC 060 (6145-8050). 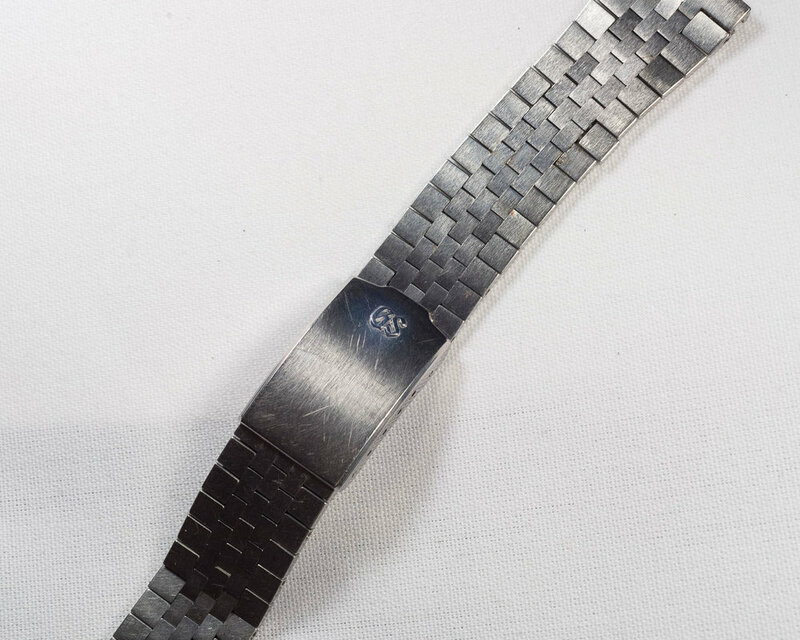 This watch was in excellent condition and it still retained the nice original sharp lines. 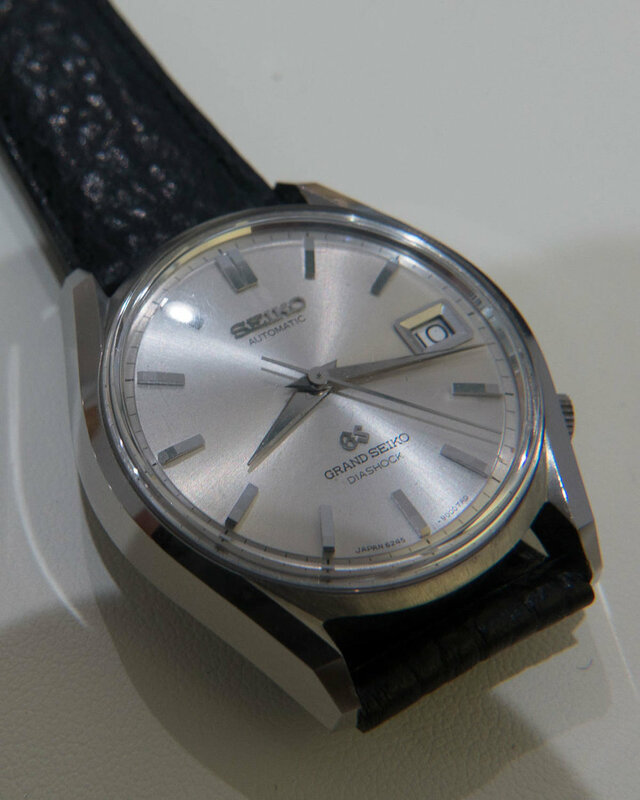 This model was only supplied on a bracelet and this example had a Grand Seiko bracelet attached but it was a XQB070 from a 5645-7010. Luckily I also have one of these watches without the bracelet so this will be a nice companion for it. The 61GAC has an original faceted crystal and stunning indicie markers as well as a complex case design, so I was happy to add this watch to my collection. On leaving the FMWV I said goodbye to Arnaud and then headed across to Akihabara. Here I checked out a number of the general stores, like Yodobashi and BIC Camera, to see if they had any interesting pieces for sale. I also dropped by the Hardoff store in Akihabara where they have numerous watches for sale. There was nothing unique here so I quickly took a look in the plastic cube stores that are situated in the Electric Town area in Akihabara. There was nothing to be found here so I then proceeded to the Ueno Science Museum. 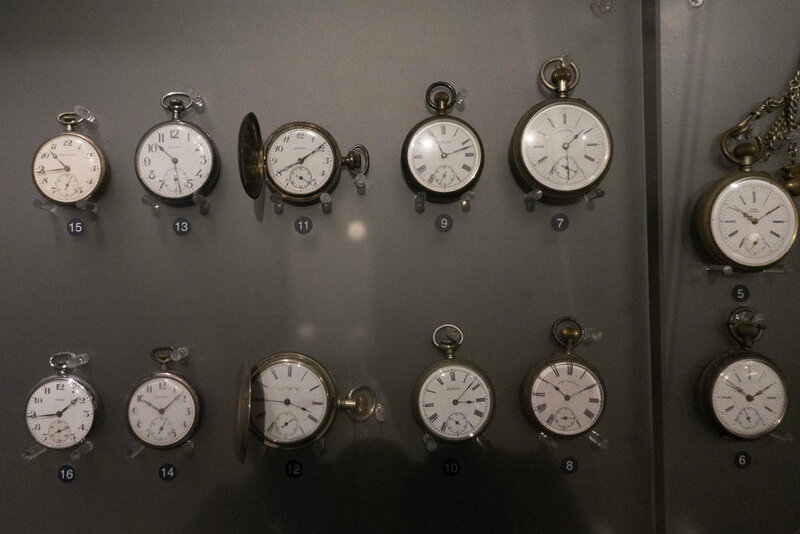 At this museum there is a small section with a brief history of time pieces and examples of different watches. 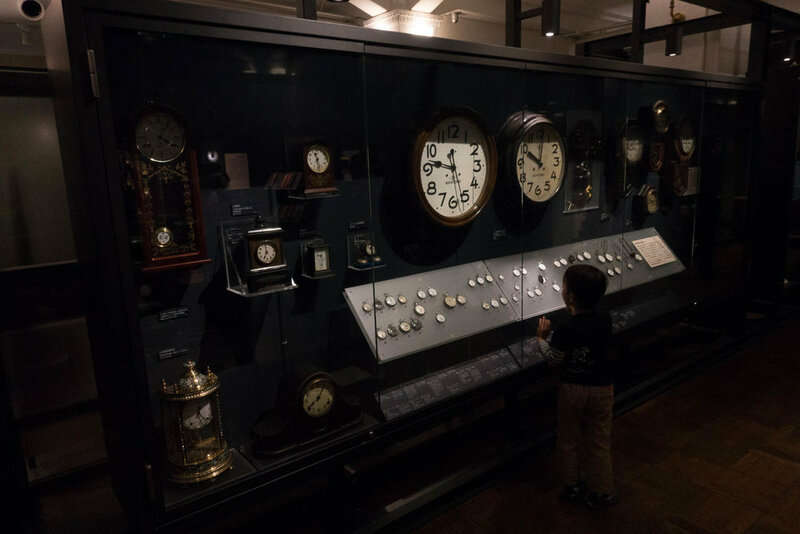 This was interesting but if you are looking for a more comprehensive rundown on the history of timekeeping your time would be better spent at the Seiko Museum. 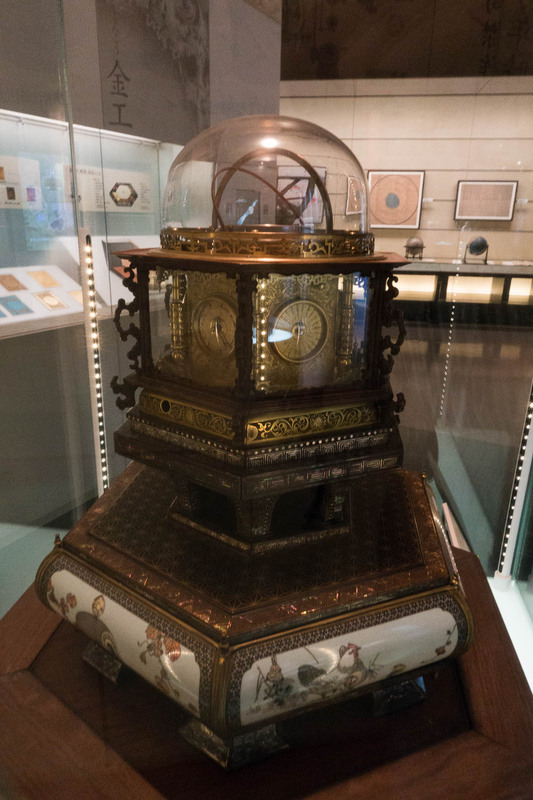 The reason that I went to the Science Museum was to see the Myriad year clock (万年自鳴鐘, Mannen Jimeishou) that was constructed by Hisashige Tanaka in 1851. This is an amazing feat of engineering and the clock is considered an Important Cultural Asset by the Japanese government. The clock features multiple clock faces and different types of time keeping displays. 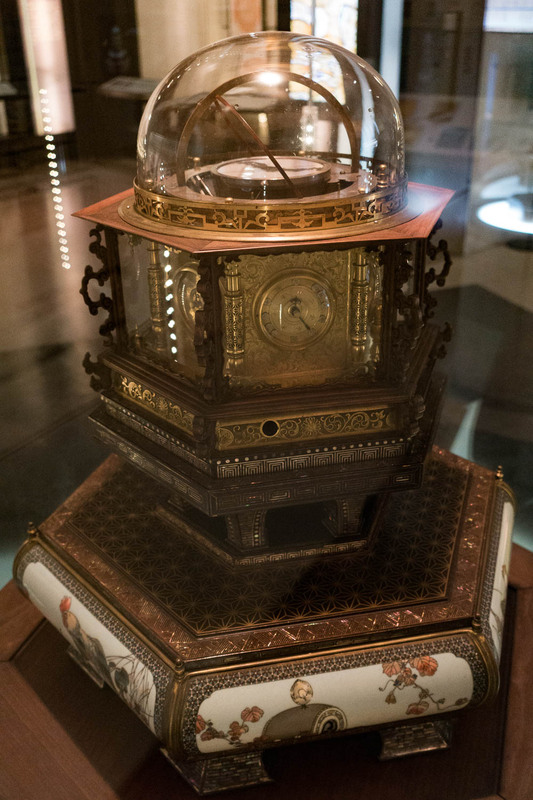 The clock will run for a full year on just a single wind as it is powered by a large spring in the base of the clock. 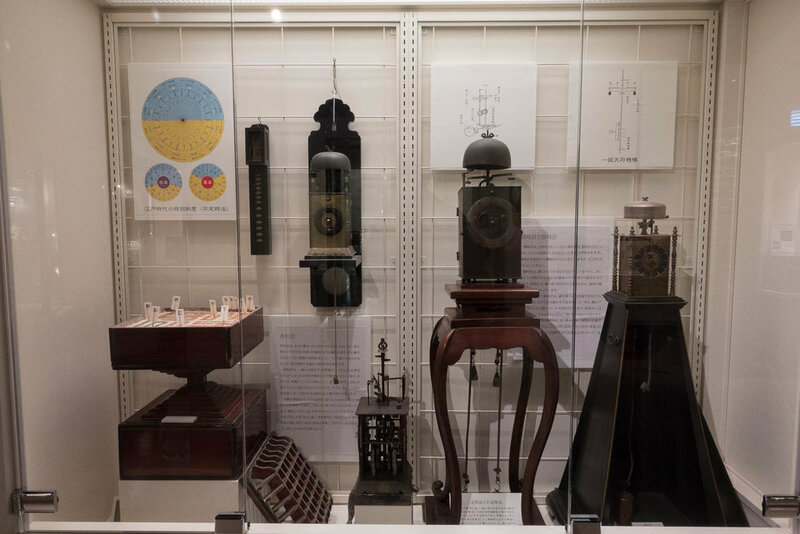 In addition to the Myriad year clock the museum also has a range of interesting exhibits with space vehicles, different technology displays and also natural history exhibits. After leaving the museum I walked down to Mizutani’s watch store in Ueno. As always there was an interesting mix of various models and lots to see but nothing really caught my eye on this visit. Monday started with quite poor weather and by late morning it was snowing considerably and there was also a lot of wind. During my previous visit to Japan in November I picked up the Limited Edition Starlight Cocktail Time Presage. This has a fantastic blue dial and when it was announced there was also another model announced at the same time. 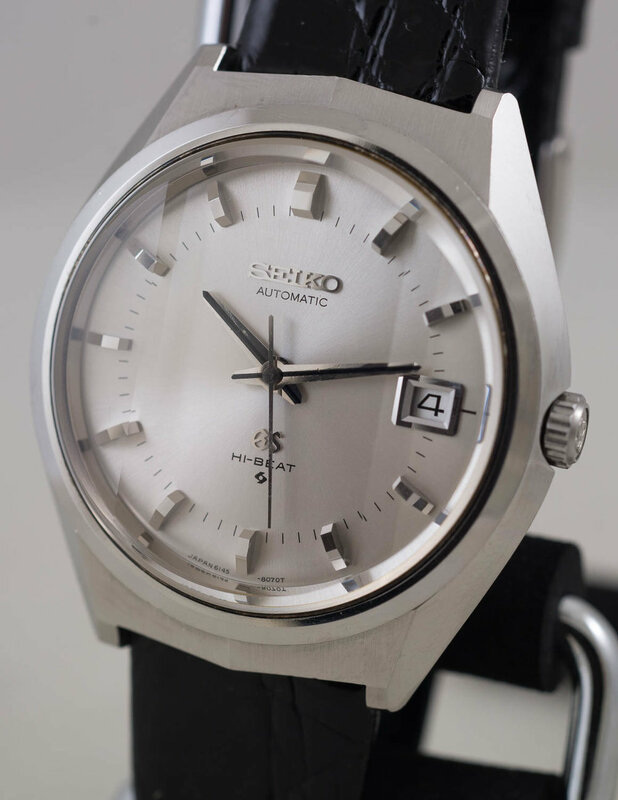 This was the SARY089 Sakura Fubuki model (4R35-02F0) that features an intricately patterned dial. This model had been released a couple of weeks earlier but I had not seen any examples for sale in the stores I had visited so far on my trip. I decided to head to the Ginza WAKO store and see if they had an example still in stock. Luckily it is possible to enter the store directly from the Tokyo Metro Ginza station directly so I did not have to brave the appalling weather outside. When I arrived at WAKO they did still have a couple of examples in stock so I was able to pick one of these up. 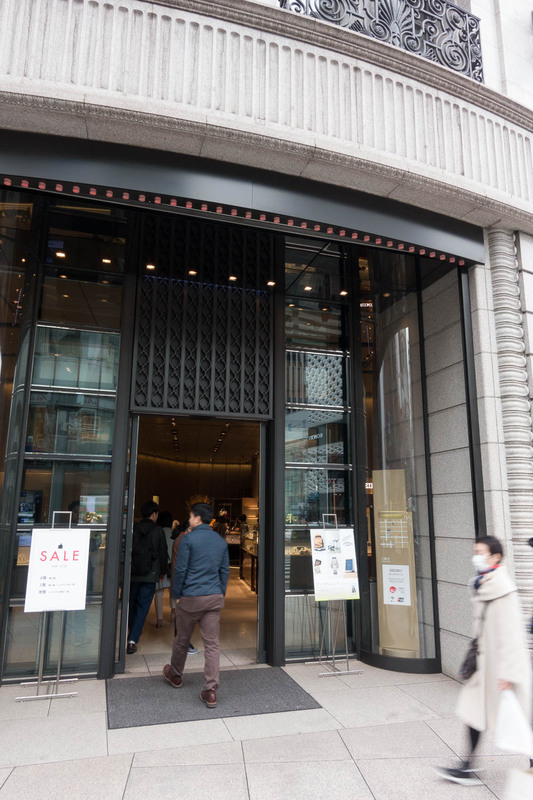 The shopping experience at WAKO is extremely pleasant and the staff are very attentive as you would expect for a high-end Japanese department store. Purchasing this watch at that time turned out to be the correct decision as I did not see a single example throughout the rest of my trip. 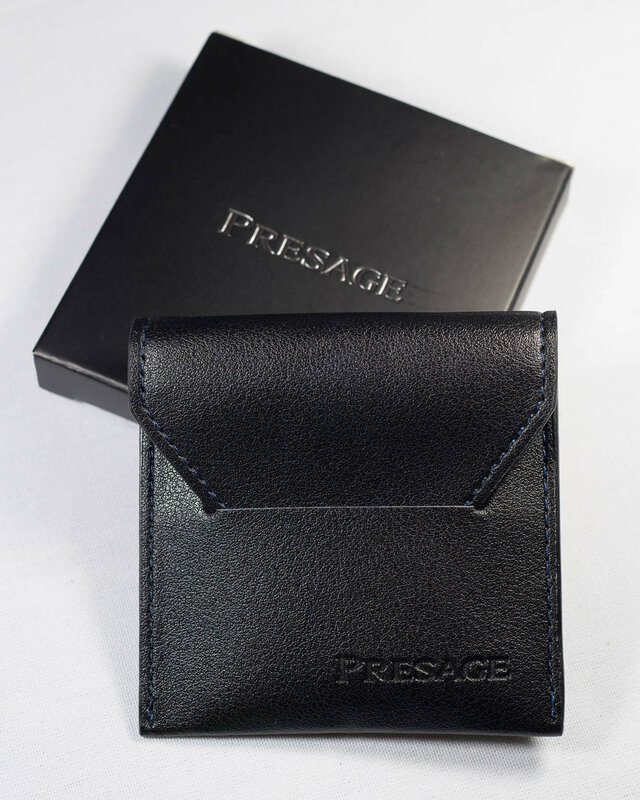 In addition to the watch I was given a promotional item that it was a leather Presage change pouch. After leaving WAKO I headed south for a few days of work. With the inclement weather the trip took more than twice the regular time as the rapid trains had all been canceled due to the heavy snow. On the Friday I had finished up work i headed back to Tokyo. I visited a few different stores around the Shinjuku area where I would be staying that night. The first was the Kohmeyeo satellite store that is a couple of blocks from the main store. This store is mainly focused on fashion but they do have a few watches there. Surprisingly they had a Seiko H558-5000, a.k.a. Arnie, in quite good condition and the price on this was very reasonable. I already have this model watch so decided to pass on it but kind of regret do so now. I dropped back into the store just before closing and the watch had already been sold. I also visited the Shinjuku Ippuukishi store and Best Watch but these stores did not have anything that caught my eye. 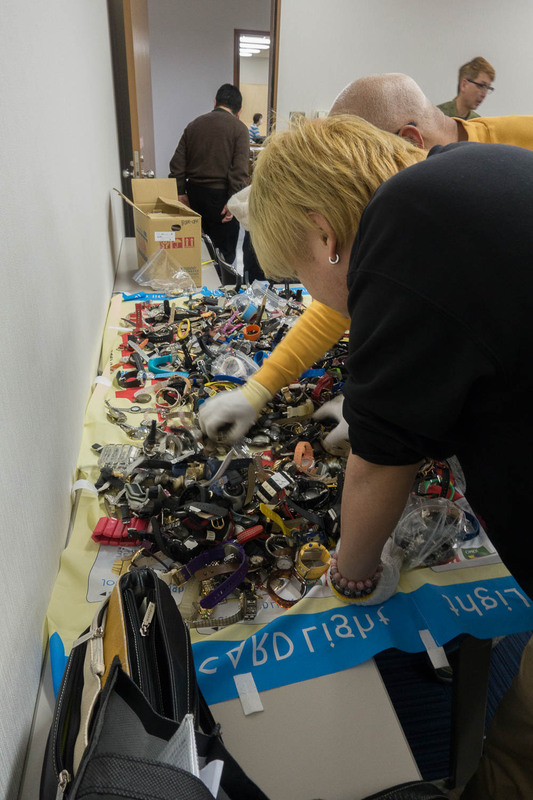 On the Saturday morning I decided to visit the Funabashi Flea market as I had not been to this before. This is held in the carpark of the Funabashi racecourse but it is considerably smaller than the Tokyo Flea market at the Ohi Racecourse. There were numerous people with watches for sale but no real bargains to be found. The small turnout may have been due to the very cold and windy weather but even if the car park was completely filled it would still likely not match the Tokyo Flea Market so I am unlikely to be heading back there. After seeing all of the stalls at the market I grabbed some breakfast at a restaurant just across the road and then checked out the Bookoff Super Bazaar that was in the shopping centre next to the racecourse. The Bookoff Super Bazaars have a wide range of second hand products for sale including clothing, toys, furniture and watches. You never know what type of things can turn up in these so I have found them to be worth checking out if I am passing by. This time they did not have any interesting items so I left empty handed. I then proceeded to visit a number of different Bookoff Super Bazaars and resale shops as I made my way down to Yokohama throughout the day. 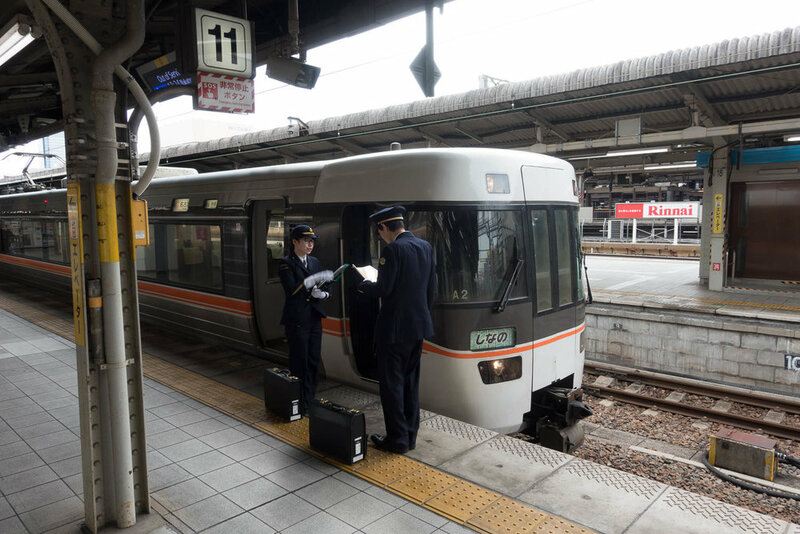 During the train rides I saw another train driver using an issued Seiko railway pocket watch. On Sunday morning the weather continued to be very cold so I skipped going to the flea market and chose to sleep in instead. When I did decide to head out for the day I picked a random suburb and then wandered around it seeing what I was able to find. On this day I headed north west from the city to Tokorozawa and then walked around this area. In the main part of the city was a Bookoff Plus store and here I managed to pick up a Seiko Majesta (9063-5010) in excellent near NOS condition. 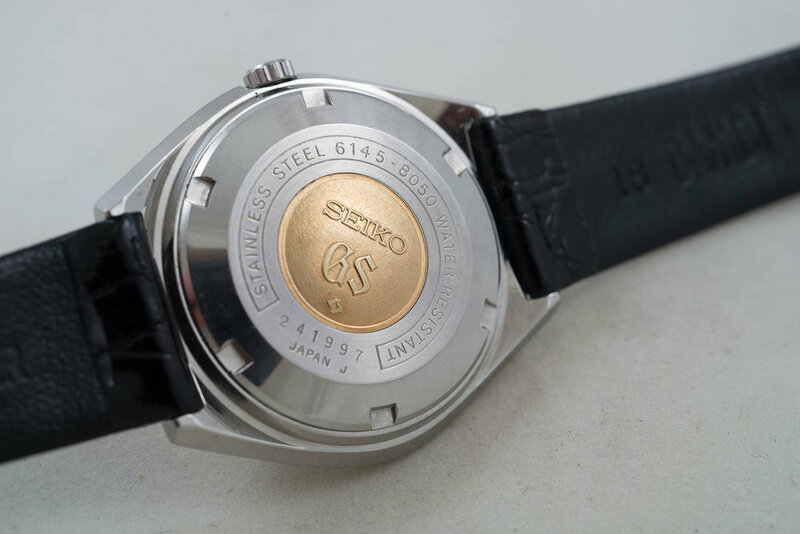 The 9063 is an interesting movement from Seiko as it is a Twin Mode Quartz model. This is different from the Twin Quartz watches that had two quartz crystals but instead has a single quartz crystal that is able to resonate at two different frequencies. After my purchase in town I decided to walk further into the surrounding suburbs. During my explorations I came across a Hardoff store with no deals to be had, but I also found a Treasure Factory store. 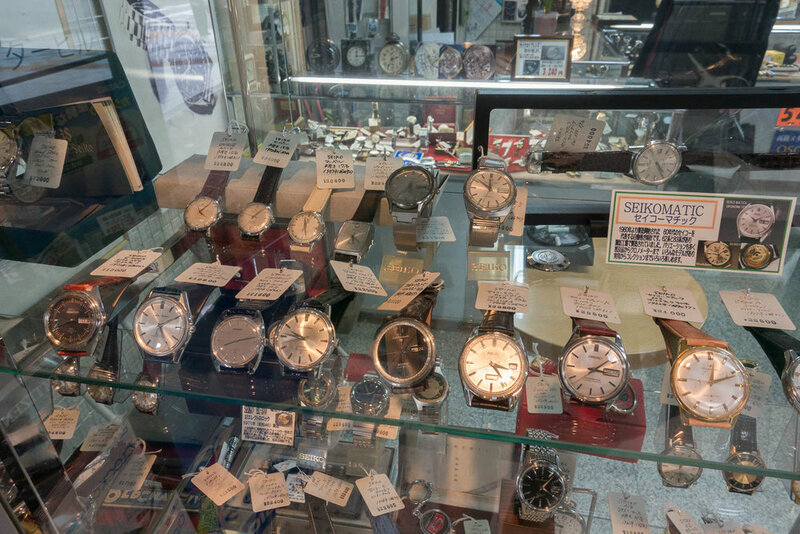 Treasure Factory is a similar second hand store that has a wide range of products including watches. At this store I found a very well priced 7548-700F diver. This is the quartz blue dialed export model with SQ on the dial instead of the traditional JDM text “Water 150m Resist”. 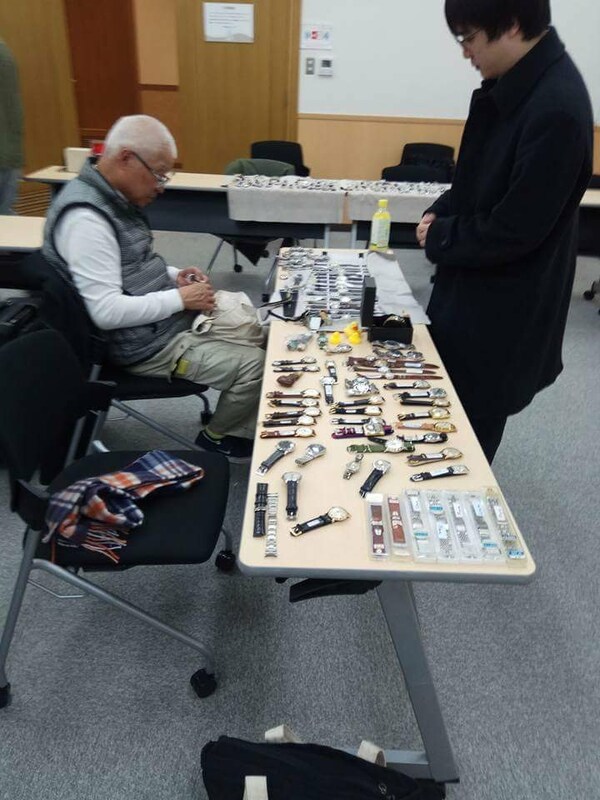 It is not clear why an international export model would show up in a small Japanese suburb but it is likely the owner picked up the watch when on holidays overseas and then eventually decided to sell it off. This was a nice addition to the collection as I mainly have the JDM versions of these models and did not have the blue dialled international release. The hands have some discoloration but luckily I have a set of replacement hands for this. I then headed back to the city and later that evening I caught up with Bjorn who is another watch collector who is based in Tokyo. We grabbed a couple of drinks and had dinner while spending a very pleasant few hours catching up. 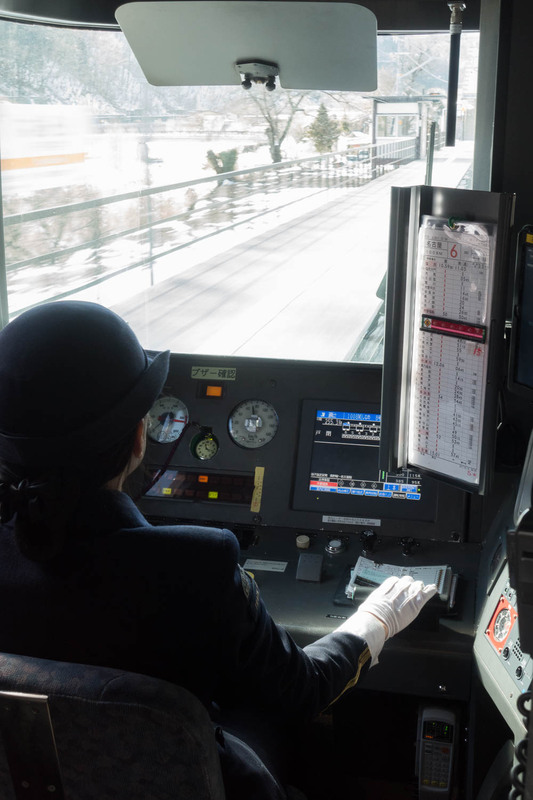 The next morning I caught a train from Shinjuku to Kami-Suwa in the Nagano region. This is where the Seiko Epson headquarters are located. I arrived mid-morning and walked a couple of blocks down to the shore of Lake Suwa. It was still quite cold and there was a lot of ice on the lake surface but it had not frozen completely over. When talking with the locals it is apparently quite rare for the lake to freeze over anymore. Not much had changed for this visit but I will do a seperate write up on this tour and include a link to it once it is completed. I spent a pleasant evening at a local ryokan on the shore of Lake Suwa and enjoyed some excellent local cuisine. On Tuesday morning I had intended to stop by the Gishodo Museum but this was closed for renovations so I caught the train to Nagoya. On this train ride I was seated in the leading carriage so was able to see the drivers compartment and their issued pocket watch in use. When arriving at Nagoya I stopped by the Nagoya Bookoff Super Bazaar and there were a wide range of watches. 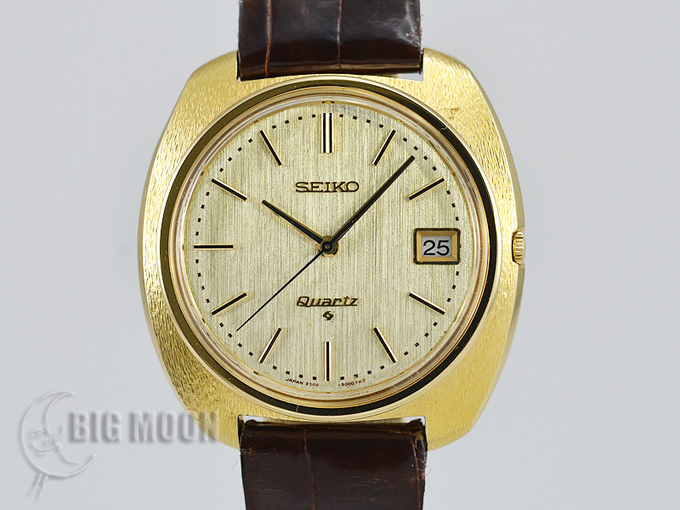 I picked up a Seiko CHG208 (7820-5350) from 1978 for just a few dollars. This is a simple early quartz model that I did not have an example of. After leaving the Bookoff I walked down to the Bigmoon store in the Naka Ward. This store always has numerous interesting pieces and this time was no exception. They had a nice example of an Astron 35-9000 that looked great. They also had a stunning looking SBWA002 which was one of the first model Spring Drive models released in 1999. This watch has a solid 18K case and considering the importance of the model was very fairly priced. I ended up not making any purchases here despite the interesting models on offer. Next I walked to the nearby Komehyo store. Here they have a mix of both used and second hand models for sale. There was a few interesting watches including a model from Shizukuishi watch studio. 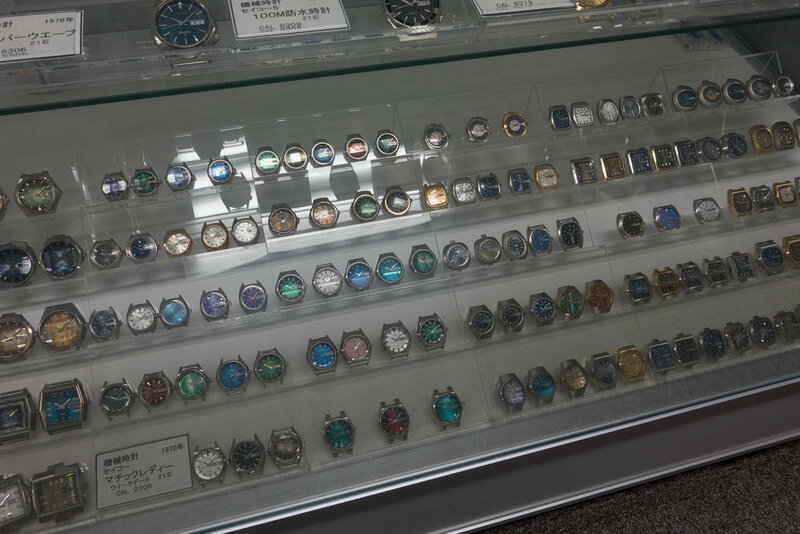 These watches are custom made at the SII Morioka facility and do not often come up for sale. This was a simple but very nice watch and reasonably priced but I would prefer to receive one of these from the factory myself. 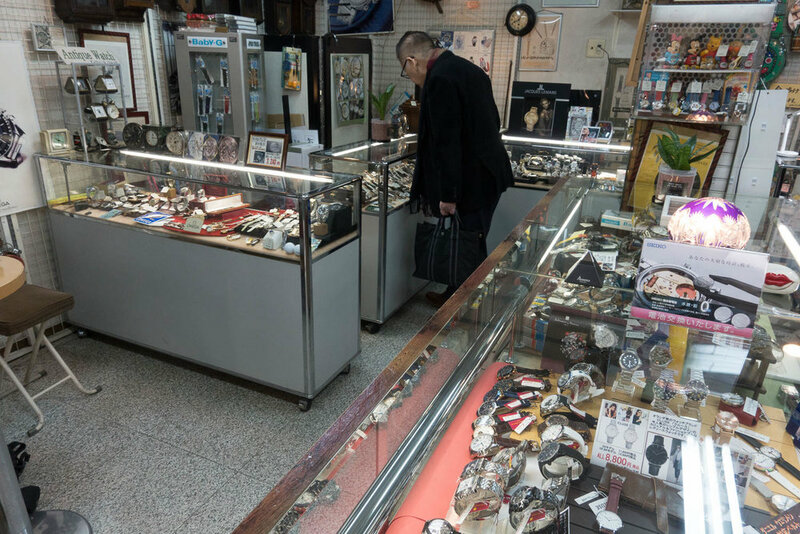 After leaving Komehyo I crossed the road and walked down a covered mall to a small vintage watch seller. This store always has a range of interesting pieces and is worthwhile stopping by. They had a number of nice pieces but nothing that I decided to add to my collection. On the Wednesday morning I traveled south to Osaka. 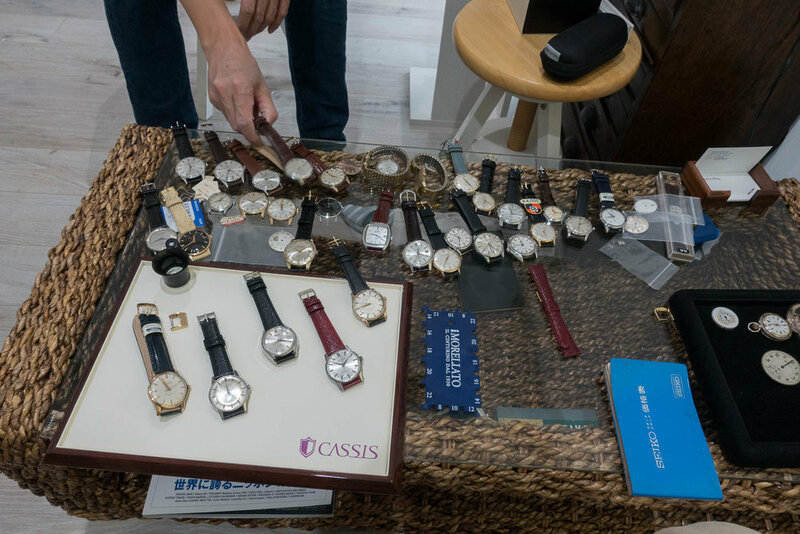 Once there I stopped by the small vintage watch store in Hommachi at entrance 9 of the Semba Center located under the highway above the Chuo line. That afternoon I headed to the Akashi Municipal Planetarium in Hitomarucho located south of Kobe. 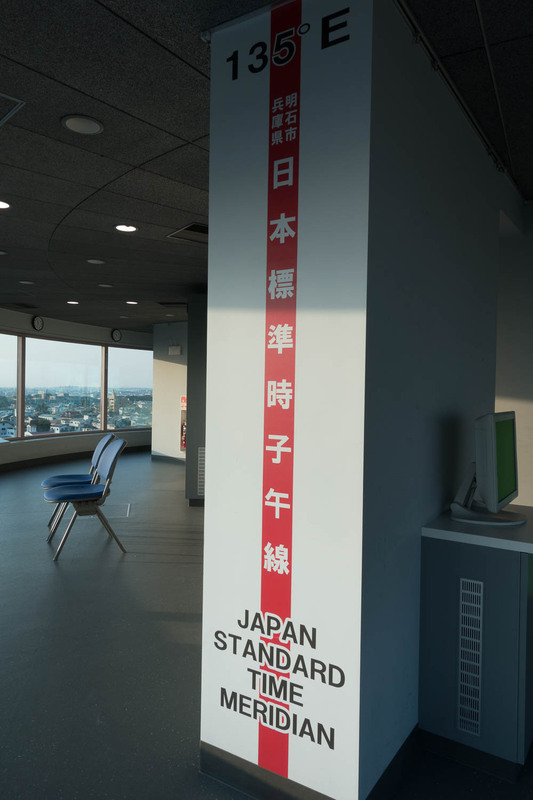 The planetarium is situated on the 135’ longitude and this is the meridian for JST (Japanese Standard Time). This meridian was officially adopted on January 1st 1888 as the official location for the Japanese standard time and this is where the sun will be exactly overhead at noon. 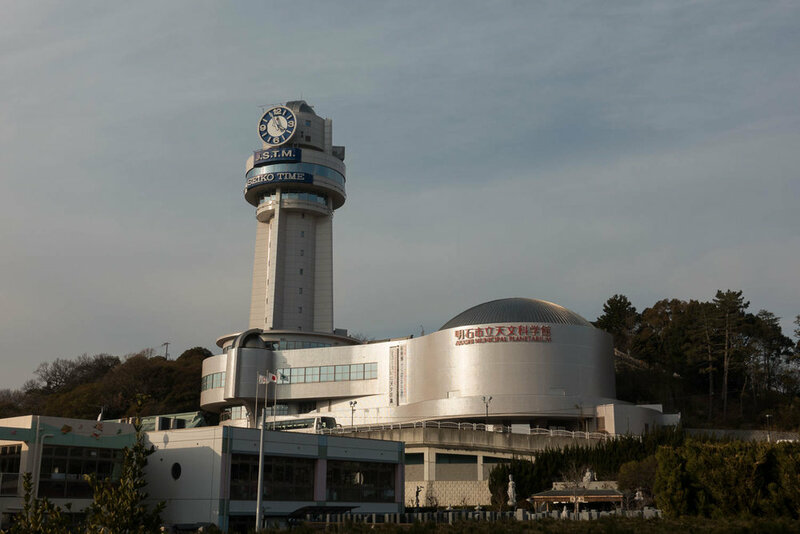 The building was constructed in 1960 and is dominated by a 52m tall tower that is topped by a 6.2m diameter clock with Seiko branding. The facility was built as a museum for time and space. 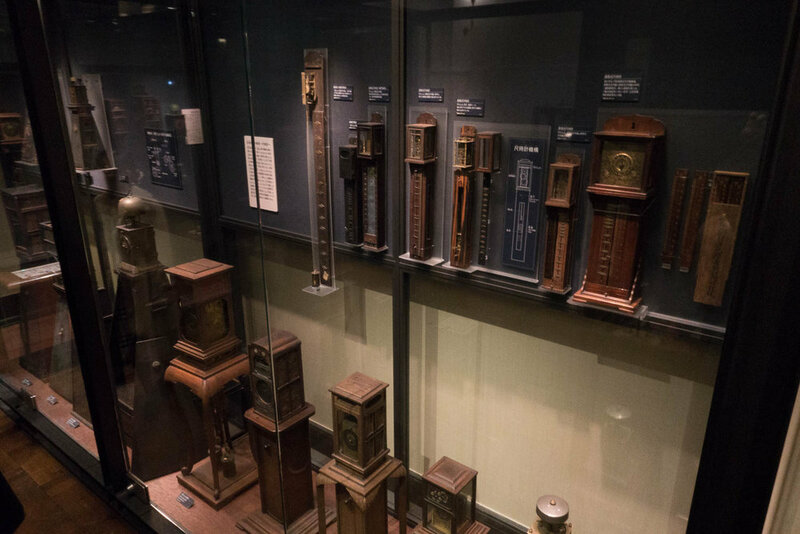 Inside there are a number of exhibits looking at the different timekeeping technologies. 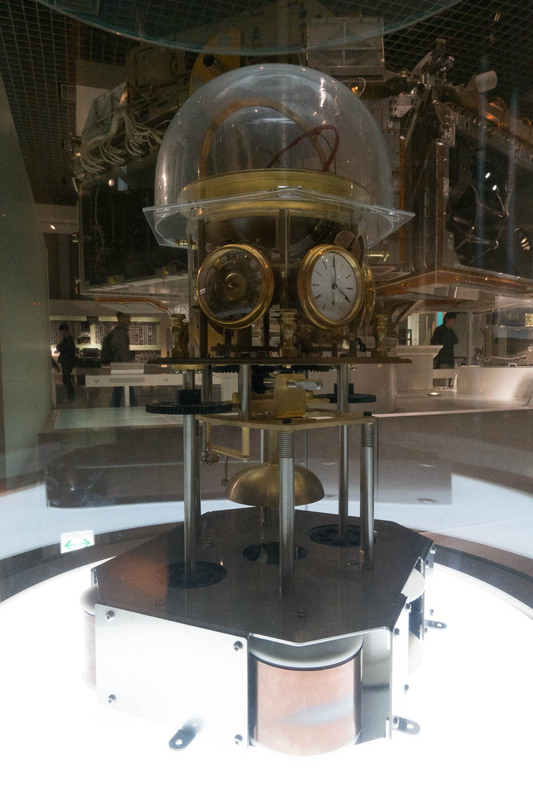 There is also an example of an atomic clock and some equipment designed to sync with the countries radio time signal. 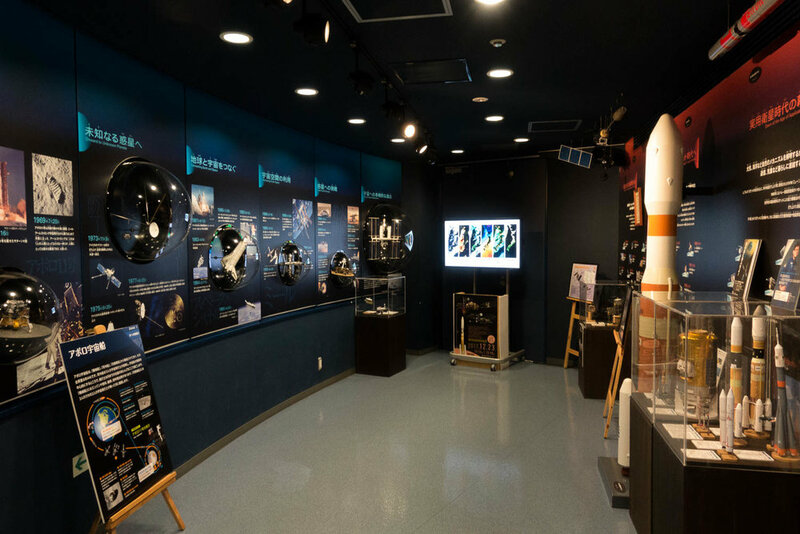 In addition to these exhibits there is also a planetarium and exhibits on space exploration and related items like telescopes. After checking out the exhibits I left the planetarium and went to Hitomaru-Mae station that also is on the same meridian and has a indication marking visible on the platform. On Thursday I woke to a cold and rainy morning. The weather was not conducive to really exploring any part of the city so I instead decided to visit AnyTimeWear a vintage watch reseller I had previously visited on earlier trips. There were quite a few nice watches for sale including a NOS 62GS that looked fantastic but was a little more than I wanted to pay at the time. After checking out the items for sale there I headed back to Shin-Osaka station, just a single stop south, and caught the shinkansen back to Tokyo. It was snowing in Tokyo again on the Friday morning but luckily this was not too significant and did not impact the trains or other transport. 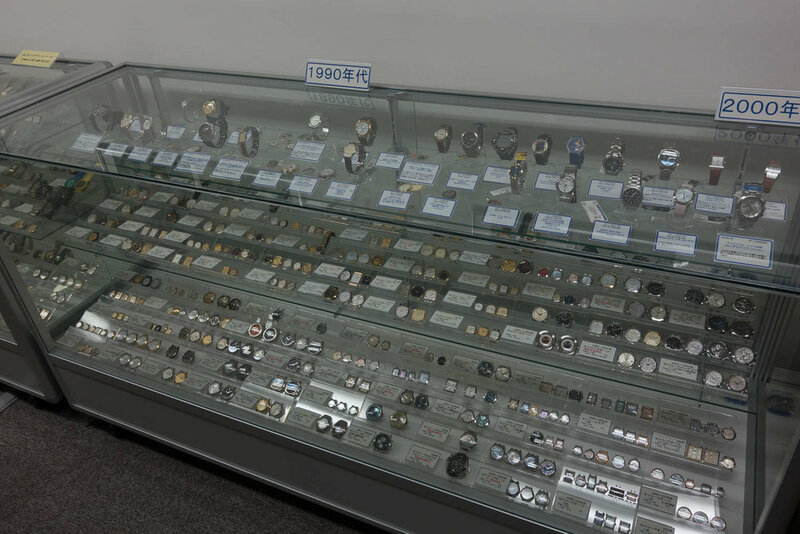 I headed across to the Seiko Museum in Sumida to do some research on a number of topics I was investigating. I arrived a little after they opened and met with my contact and friend Kumagai-san at the museum who helped me get access to some of the research materials. At around 11:30 we took a break for an early steak lunch from a nearby restaurant as they get very busy later in the day. The museum General Manager Kobari-san also joined us for lunch and we had a nice conversation discussing some of the historic milestone of Seiko. After lunch I headed back to the museum and continued my research. 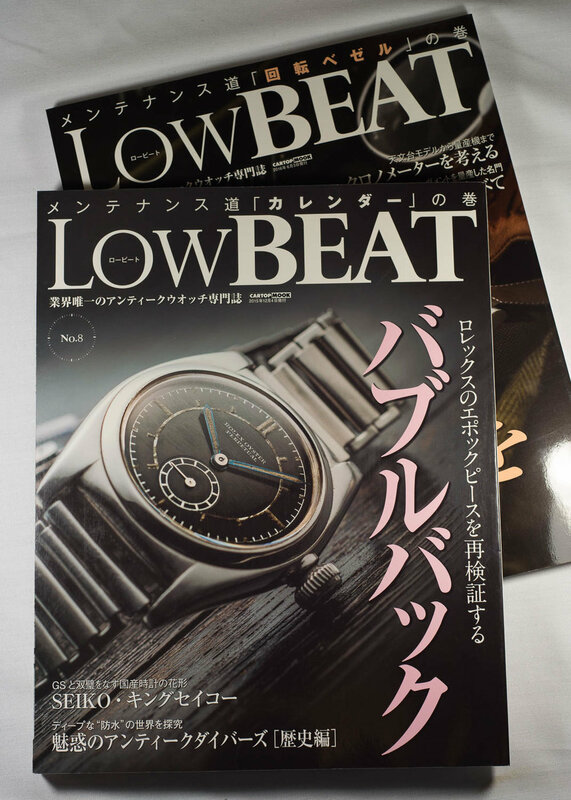 Later that night I picked up a couple of previously released issues of the Japanese watch magazine Low BEAT from the book store Maruzen located in Marunouchi. These issues contained a couple of articles on Seiko chronographs and King Seiko models and were useful additions to my small library collection. I also visited the Maruzen in Nihombashi but they had a slightly smaller selection with no additional issues available. On the Saturday morning I attended another FMWV meeting that was held at the Nakano Sun Plaza building. This had the usual range of watch sellers but the general turnout was smaller than the Ikebukuro meeting. At this event there were a couple of interesting pieces. One was a NOS 6105-8110 that was provided with the original XGL731 tire track strap. This was in excellent condition and the price was about what you would expect to pay for a piece in this condition. There was also a first model Citizen radio sync model watch in NOS condition. This watch was well priced but I already have an example of this watch. The only watch at this market I ended up purchasing was an early Seiko Super. After leaving the FMWV meeting I walked across the road and checked out the different stores in the Nakano Broadway centre. There are many different stores here with a mix of second hand stores, cube stores, stores with new models and antique stores. With such a large number of stores it is always worth checking them out as almost anything can turn up. There was nothing at these stores so I next headed across to a Hardoff store at Kichijōji. 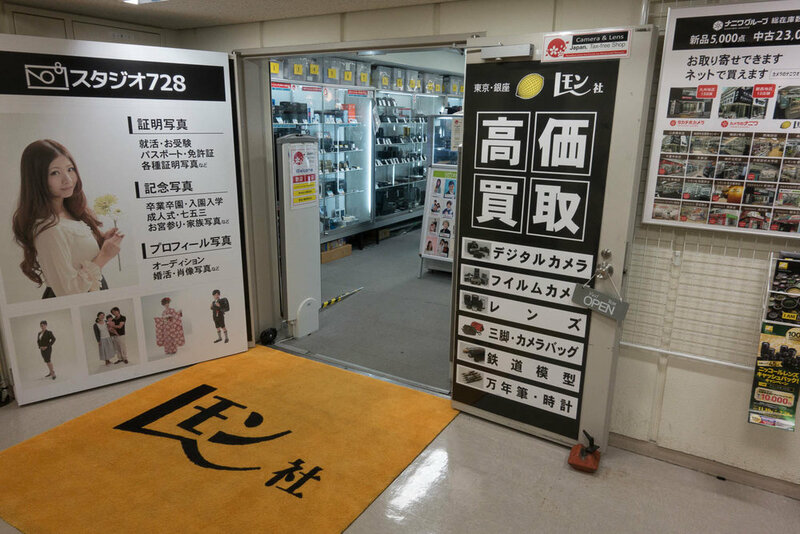 At this store I picked up a Seiko SNJ013 (H023-00F0) from 2006. This watch has a hybrid LCD display behind the main analog handset. In the early afternoon I visited the Yodobashi Watch store in Shinjuku. While there I picked up a few different pieces. The first was a Wired 200m shrouded diver model AGAJ405. I purchased this model as it has an unusual quartz movement that moves the seconds hand in 1/4 sec (14,400bph) increments. The movement is a VH31 and this is used in a range of new models with a similar design. There is also a similar VH67 movement that adds a 24 hour hand, a date hand and day hand and these are used in similar models with compass instead of the diver style bezel. The second Wired model I picked up was a Solidity AGAM701 that was released as a Limited Edition at Baselworld 2017. The model had 1600 pieces with 1500 of these released to the JDM and 100 units tagged for international sale. This movement was first used in the 2015 AGAM601 Limited Edition (2500 pieces) that Big Boss wears in Metal Gear Solid V: The Phantom Pain. This model is highly reminiscent of the Seiko G757 based models from the early 80’s and was designed to fit into the game universe that is set in 1984. Both of the Wired pieces are relatively low cost but come on terribly designed bracelets that feel like they are missing their end links. I think I will likely end up putting each of these watches onto a nato style strap that will suit them better. The last watch I purchased at this time was the Citizen Independent BA7-018-51. This watch has a bullhead design, date and 12 hour chronograph function. There are a silver and black/gold versions as well as the black version that I purchased. The brochure for this model references the Citizen bullhead designs from the 1970’s as the inspiration for this model. On the Sunday morning I visited the Tokyo flea market at Ohi Racecourse again. At the market I purchased a small Seiko box that was originally used to distribute watches to retailers. The straps and buckles for some model during this period were sold and distributed to retailers separately. At the market I picked up a couple of issues of the World Wrist Watch magazine that have some interesting articles on Seiko models. There was also a Grand Seiko brochure focused on the 9F caliber. In addition to the magazines I also picked up a Seiko Galaxy 7NC1-8A10. This series of watches has a logo that is similar to the Credor logo so people occasionally incorrectly believe that these are related in some way. The Galaxy models were comparatively low cost quartz models that were released in the late 80’s and early 90’s. 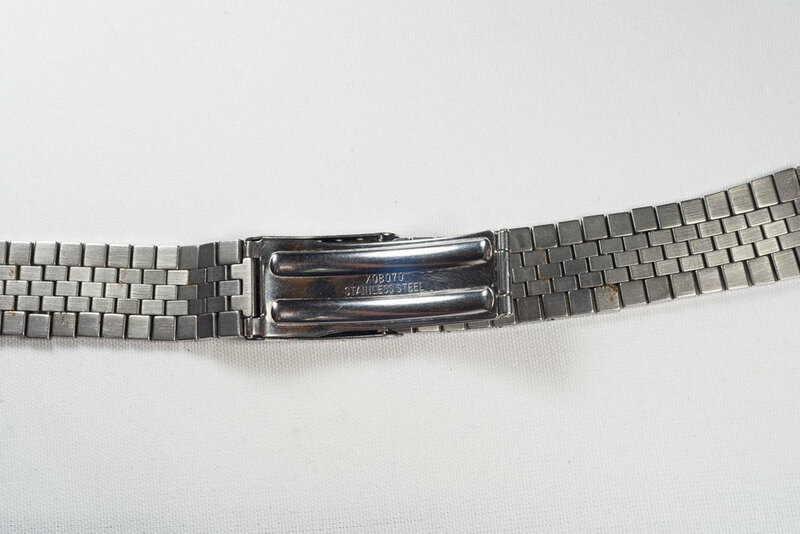 The final item I picked up was a small Seiko ladies watch that I purchased for the mesh strap to use with a 1944 High Beat model as I had donated the original bracelet to the Seiko museum. 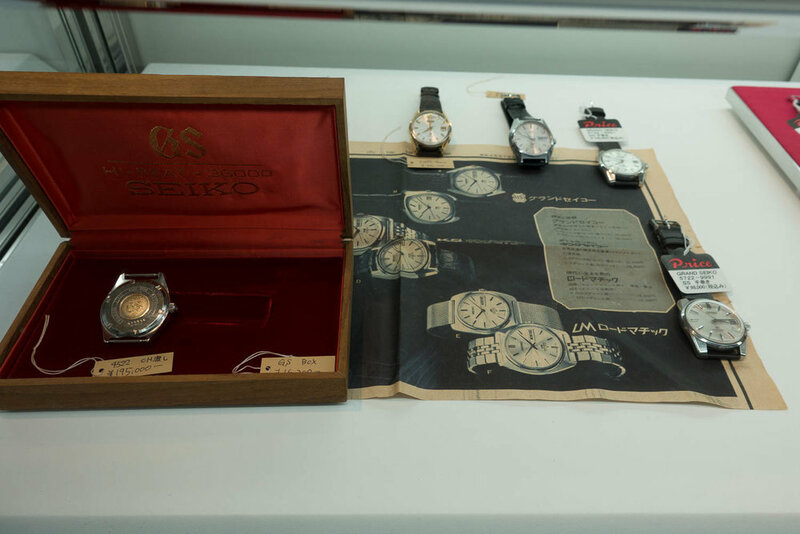 As I had a few hours before I needed to leave for my flight home I dropped by the Seiko Museum and looked through some of the press releases and Seiko News issues from the late 1960’s. This was informative as always and it was quite interesting to see the relatively low key way in which the 6159-7010 was announced, considering the development time that was involved with the watch and the number of patents and new technologies associated with it. After leaving the museum I headed back to Shinjuku to grab my bags and head to the airport. On the way I stopped by the Uniqlo store and grabbed a t-shirt with the image from the artwork The Great Wave off Kanagawa by Katsushika Hokusai. Many people associate this image with the Seiko water resistance logo seen on diver case backs, so it seemed an apt way to finish my trip. I look forward to returning to Japan when I am next able to as it is always a pleasant visit for a watch fan. To help people locate some of the stores and destinations I describe in this article I have put together a map marking the different specific locations. This map can be found HERE.